Put together by Burners, this pack has all you need for when you leave camp to explore the Playa. Use the promocode 4ABURNER to get a discount at Comefuzed. Hydration packs are a popular choice for many Burners. With 2 L of water on your back, and other pockets for your gear, these packs is an all in one solution. A variety of styles and colors are available. Make sure to get a cleaning pack to keep your water bladder clean. Hydration packs are a popular choice for many Burners. Miracol Hydration Backpack keeps your fluids cool with the inside thermal insulation and insulated tube that lasts up to a duration of 4 hours. This hydration pack features military-grade durability which will keep the content of your backpack safe while it weights only 1 pound, definitely won't burden you in outdoors. Hydration packs are a popular choice for many Burners. U'Be Hydration Pack with Insulated 2l Bladder. Being designed to be water-repellent and water-resistant, bike camelbak includes 2.0 liter (70oz) BPA-free hydration tank. Exterior zipper pockets system are to stash your bottle and essentials. If you get a Hydration Backpack, make sure to pick up a cleaning set too! ALL IN ONE CLEANING KIT: including 3 brushes and a hanging frame for drying, universal for Camelbak hydration reservoir cleaning. FLEXIBLE SNAKE BRUSH: excellent for hose cleaning. SMALLER BRUSH: perfect for mouth piece cleaning. BIGGER BRUSH: used for water bladder cleaning. COLLAPSIBLE FRAME: designed for bladder drying, can be squeezed together to fit inside the bladder and allow it to air dry, suitable for any brand bladder with Maximum mouth opening 4.7" and Minimum mouth opening 1.6". Periodic cleaning with CamelBak® Cleaning Tabs™ keeps reservoir and tube free from taste and odor. CamelBak® Cleaning Tabs™ work in just 5 minutes for a thorough cleaning. Includes 8 cleaning tabs per pack. This handmade Nordic drinking cup connects easily with the Carabiner attachment. 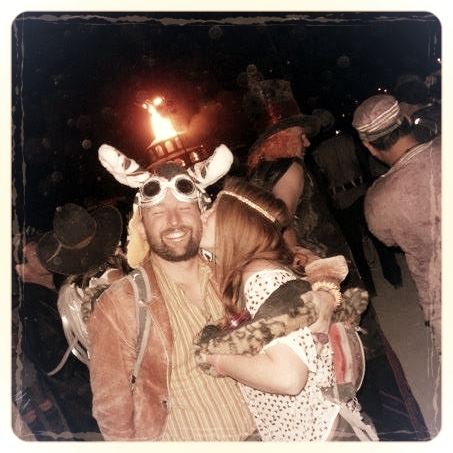 Water bottles are a part of your essential gear out in the desert, and Burning Man is no exception. This water bottle has a handy clip and can fold up into a nice pocket when it’s empty.